After my second look at Philomena, I was even more impressed at how emotionally gripping and satisfying the drama is. I’ve always had gripes with on-screen Christian portrayals in cinema. I find them to be somewhat caricatures or barely believable or just plain stupid. Very few films give us characters that strike the right balance between the Christian ideal and reality. Thankfully Philomena is one of the few films and there were some very solid lessons in its crux. First of all a little background, Philomena is the true account of Philomena Lee’s search for her lost son adapted from the book the lost child of Philomena Lee. Philomena had her son taken away when she was a teenage inmate of a Catholic convent. Fast forward to 2004 and Philomena’s daughter runs into journo Martin Sixsmith who himself has run into hard times having recently lost his job. Martin arranges a magazine assignment about her search for him that eventually leads to America. 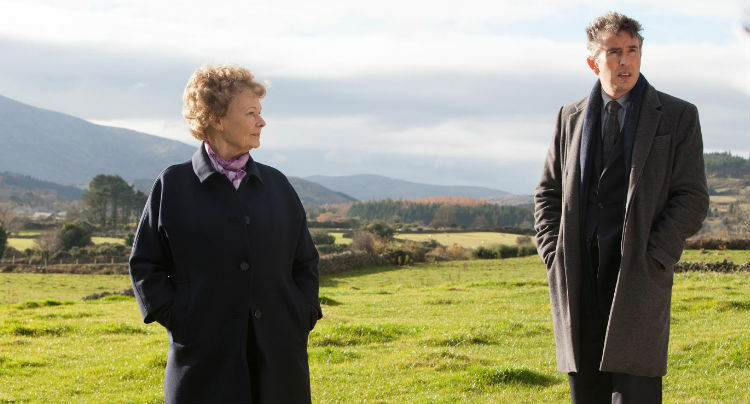 Along the way, Martin and Philomena discover as much about each other as about her son’s fate. As far us character goes we given somewhat polar opposites in Philomena and Martin. Philomena obviously believes in God and Martin is an atheist. Philomena has a bubbly persona and Martin has rude as his default setting and so on. Despite their stark differences they’ve both been served up the sourest of lemons by life at one point in time. When Sixsmith is dismissed from the Labour Party in disgrace, he is at a loss as to what do and Philomena has lived most of her life with the burden of the knowledge that she has a son out in the world after he was taken from her in her youth. Their escapades culminate in confrontation with nuns where we get the “money scene” and the moment that probably gets Dench her Oscar nomination. We see her carry out the simple yet difficult task of forgiveness which saw her light at maximum brightness. It reminded me that true Christianity is still a very personal thing. The distinction between the nuns who represent the Church institution and someone striving to follow Christ is clear. The church has the nuanced appearance of acting as a beacon of light to the world and a product of that world. As regards to the latter, the story of Philomena Lee brings to light the great shortcomings in which the church often participated, nurtured and in some cases furthered. The church institutions and Christians in general haven’t done much to paint themselves in glory and have contrived to find themselves on the wrong side of history time and time again. The church has too often in a lot of instances been ignorant, afraid and egregiously unjust. We are all complicit in untold, undeserved human misery whether on a small or large scale. This story however reminds us that love and forgiveness still has a role to play in the narrative of life in spite of the rifts fashioned in whatever setting. She understands the weightiness of sin like everyone but is lost on how much who we are as Christians is based on grace and not deeds. Nowhere does the Bible ever suggest that we can make atonement for our sins through suffering. It insists that we are helpless to do anything about it. We can never become righteous enough for God through what we do: ‘For no one can ever be made right with God by doing what the law commands. The law simply shows us how sinful we are’ (Romans 3; 20). Isaiah tows the same line: ‘All of us have become like one who is unclean, and all our righteous acts are like filthy rags. At the end though, it’s the importance of forgiveness that resonates after watching this film. She says she chose to forgive because she didn’t want to hate anymore. Bitterness, anger and an unforgiving heart weigh down no one but us. Last year, I blogged on some of my favourite Christians last year and this definitely joins the list.